Congratulations to Emily Lowe, recipient of the Ministry of Youth, Sports and Culture’s Outstanding Youth Award. 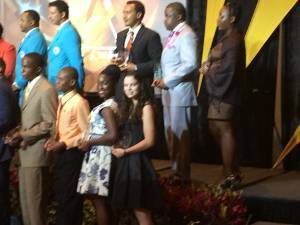 Emily was one of 100 outstanding youth between the ages of 16 and 25 from around the country who were honoured for their efforts and achievements in sports, arts, and culture in the Bahamas. Emily is a longtime rider at Camperdown Equestrian Centre, and also volunteers during holidays and weekends at Mariposa Stables, and Hibiscus Hill Stables. Emily joins last year’s winner, Olivia Hazlewood, as only the second rider to be nationally recognized for her contribution to our sport. Well done, Emily! 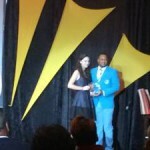 Emily Lowe receives the Outstanding Youth Equestrian Award from Bahamas Olympic Committee official Mr. Derron Donaldson.